Ben Bernanke has recently started blogging (and tweeting), and his opening topics were why interest rates are so low around the world, and a critique of Larry Summers’ “secular stagnation” explanation for this phenomenon, and for persistent low growth since the financial crisis.Summers then replied to Bernanke’s argument, and a debate was on. So who is right: Bernanke who argues that the cause is a “global savings glut”, or Summers who argues that the cause is a slowdown in population growth, combined with a dearth of profitable investment opportunities, not only now but for the foreseeable future? I’d argue both of them, and neither simultaneously—both, because they can both point to empirical data that support their case; neither, because they are only putting forward explanations that are consistent with their largely shared view of how the economy works. And the extent to which they are the product of a single way of thinking about the world simply cannot be exaggerated. It goes well beyond merely belonging to the same school of thought within economics (the “Neoclassical School” as opposed to the “Austrian”, “Post Keynesian”, “Marxist” etc. ), or even the same sect within this school (“New Keynesian” as opposed to “New Classical”). Far beyond. They did their graduate training in the same economics department at the Massachusetts Institute of Technology (MIT). They attended the same macroeconomics class: Stanley Fisher’s course in monetary economics at MIT for graduate students (was it the same year—does anybody know?) Some of their fellow Fisher alumni included Ken Rogoff and Olivier Blanchard. And that’s not all—far from it. Paul Samuelson (MIT) was overwhelming the intellectual architect of what most people these days think is Keynesian economics. Paul Samuelson is Larry Summers’ uncle. 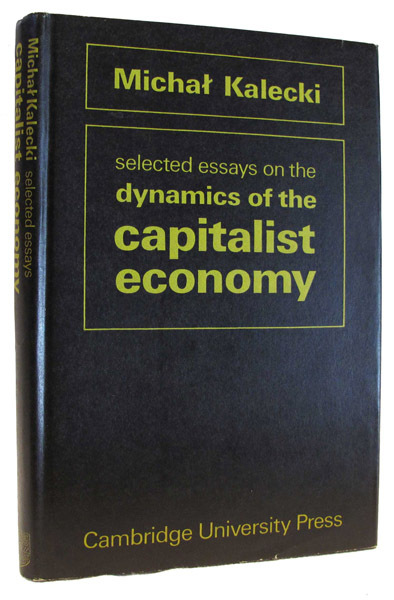 Samuelson’s “Foundations of Economic Analysis” was the core of the MIT approach to economics, and it became the model for economics textbooks around the world. Gregory Mankiw’s (PhD, MIT) market-dominating text today is a pale echo of Samuelson’s original. This group has been notably dismissive of other approaches to doing economics. Krugman (PhD MIT) leads the pack here, deriding views that are outside this mindset. If I were describing a group of thoroughbred horses, alarm bells would already be ringing about a dangerous level of in-breeding. Sensible advice would be proffered about the need to inject new blood into this dangerously limited breeding pool. But the issue would only be of importance to the horse-racing community. Instead I am talking about a set of individuals whose ideas have had enormous influence upon both the development of economic thought and the formation of economic policy around the globe for the last four decades. The fact that so much of the dominant approach to thinking about the economy emanates, not merely from such a limited perspective, but from such a limited and interconnected pool of people, should be serious cause for alarm—especially given how the world has fared under the influence of this thoroughbred group. Now, after the crisis, the horses are not so sanguine. But they are trying to understand why things went so badly wrong using explanations that are consistent with the inbred intellectual perspective from which they all emanated. Are they likely to get it right? Hardly: the odds that the explanation for our post-financial-crisis malaise can be found within the same set of intellectual ideas that didn’t see the crisis coming—and that generated policy biases that arguably made the crisis far worse—must be vanishingly close to zero. This is why students of economics are finally revolting and calling for a wider range of economic ideas to be both taught and developed in our Universities. Groups like Rethinking Economics and the International Student Initiative for Pluralism in Economics are in effect pointing out the degree of in-breeding that has occurred in economics in the last 40 years, and calling for the introduction of new blood (my School at Kingston University in London is one of the few that is responding positively to that student call). I’ll discuss the substance of the Bernanke-Summers “debate” in a subsequent post. For now I’ll close with a simple visual indication of one aspect of the shared mindset that leads them astray, however much they may appear to differ on this issue. This mindset sees capitalism as a system that either is in or tends towards equilibrium—and the key puzzle for them is explaining why it isn’t in equilibrium at any given time. 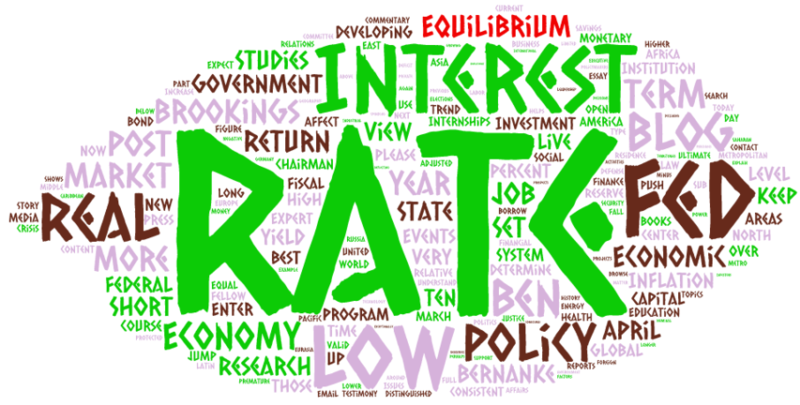 Figure 1 shows a word cloud of Bernanke’s first blog post, and the word “equilibrium” is the 9th most frequently used in the whole post. 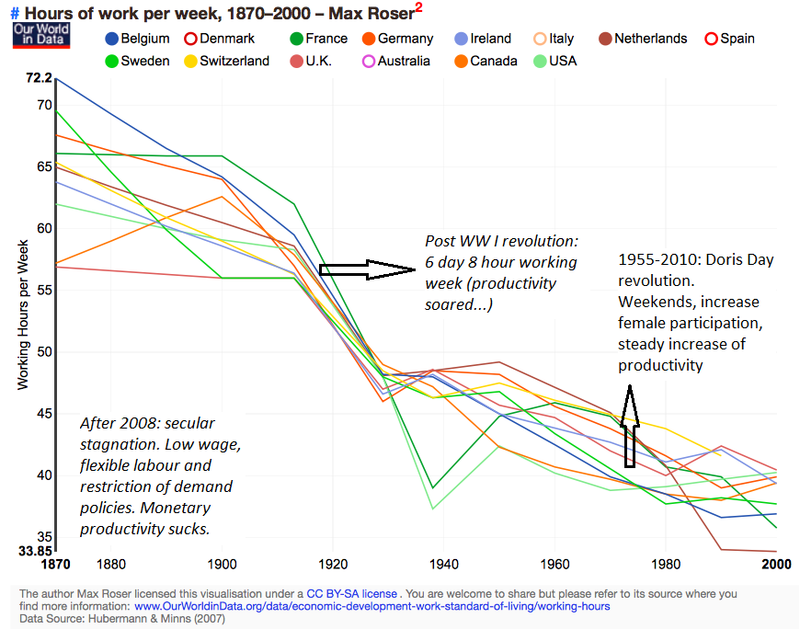 One of the marked characteristics of modern times is the decline in average hours worked (graph, via Henk de Vos). But: beware! There is more to averages than meets the eye which, for students of economics, is more important than the latest fad about regressions and statistical significance – this is about contentional significance. When real male wages started to increase after about 1880 (very large international differences, but the decline of grain prices after about 1880 boosted the process) female labour market participation first decreased, to increase again only in pretty recent times (say, the end of the fifties). Which enabled men to work less (male participation declined) and to work less hours… Anyway – don’t bother about future labour shortages. If only we start to watch less television (what do you think we do with all these hours, this time, in Dutch) there are plenty of hours to work. Though to spend hours differently we have to change the way we use time. 1) Unpaid household labour declined too, because fertility declined and the ‘washing machine‘, the mechanisation of household labour. Using oil and natural gas to heat the house instead of coal and wood might however have been experienced as a larger change by housewives themselves, though for quite some time peat (and coal and wood?) was, by most people, only used for cooking, a warmer house was a collateral product (personal aside: it is great to see, using accounts from those seemingly utterly boring village groceries, how stuff like heating oil or coffee or (quote) ‘Everlasten shoes’ (a mass product competing with the village cobbler) spread all around Europe). Mind, however, that the decline of household labour also showed up as a fast and until fairly recently almost total collapse of paid household labour by servants, house maids etcetera. Well, I’m getting carried away, have to stop this thread. 2) After 2008 the neoliberal distopia, way down based upon ideas about a pre-nineteenth century economy with subservient labour, low productivity, low wages and a reserve army of labour and where more and more of total income is siphoned of as rents, including interest on mortgage loans, took hold of the minds of european politicians – at least when they decided about other countries. They do not agree with mister Piketty, it seems, but propose policies which enable lower wages and higher rents (read their stuff about Spain, especially when it comes to lower ‘wage mark-ups’ and higher so called ‘profits’). This, of course, led to the (temporary?) halt of the productivity increase juggernaut which, in the end, enabled the fortunate decline in working hours. Once, productivity will start to increase again. Economists can’t stop progress forever. But they might succeed for another ten or fifteen years or so and, consistent with their ideas about labour they will propose policies to increase labour supply in countries with about 25% unemployment like Spain and Greece (and, in fact, Italy as Italy has anomalous high ‘broad unemployment). Dear all, increasing the pension age is of course a wise thing to do. Work is not a bad thing, at least it does not have to be. It even can be good, surely for those over 65. But we will have to make it good – and making labour subservient is not the way to go. While, Apatosaurus ajax Marsh in the room, increasing the pension age is not really a policy priority when unemployment has recently increased to 26%. But at this moment the Troika seems to think otherwise, considering Greece. It is not enought that you should understand about applied science in order that your work may increase man’s blessings. Concern for man himself and his fate must always form the chief interest of all technical endeavors, concern fo the great unsolved problems of organization of labor and the distribution of goods — in order that the creations of our mind shall be a blessing and not a curse to mankind. Never forget this in the midst of your diagrams and equations. I think this has two implications for those who want to question the microfoundations hegemony. The first is that the discussion needs to be about methodology, rather than individual models. 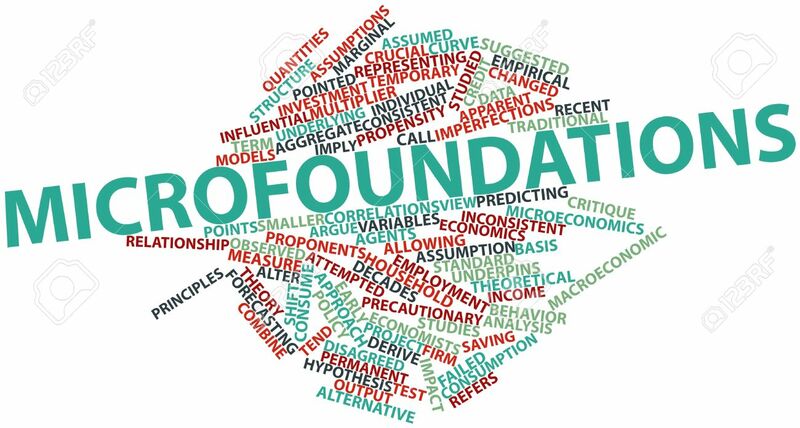 Deficiencies with particular microfounded models, like the NK model, are generally well understood, and from a microfoundations point of view simply provide an agenda for more research. Second, lack of familiarity with methodology means that this discussion cannot presume knowledge that is not there … That makes discussion difficult, but I’m not sure it makes it impossible. Indeed — this is certainly a question of methodology. And it shows the danger of neglecting methodological issues — issues mainstream economists regularly have almost put an honour in neglecting. Being able to model a credible world, a world that somehow could be considered real or similar to the real world, is not the same as investigating the real world. Even though all theories are false, since they simplify, they may still possibly serve our pursuit of truth. But then they cannot be unrealistic or false in any way. 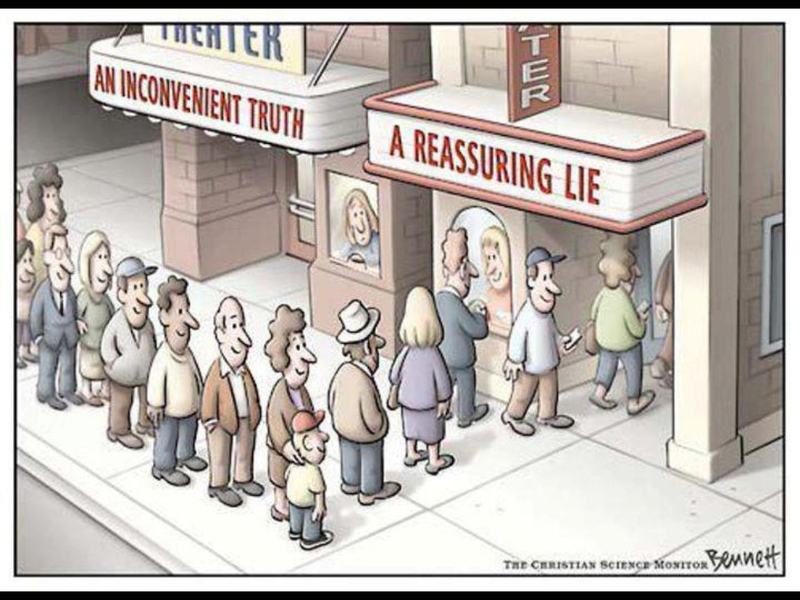 The falsehood or unrealisticness has to be qualified (in terms of resemblance, relevance, etc.). At the very least, the minimalist demand on models in terms of credibility has to give away to a stronger epistemic demand of appropriate similarity and plausibility. One could of course also ask for a sensitivity or robustness analysis, but the credible world, even after having tested it for sensitivity and robustness, can still be a far way from reality – and unfortunately often in ways we know are important. Robustness of claims in a model does not per se give a warrant for exporting the claims to real world target systems. Yours truly and people like Tony Lawson have for many years been urging economists to pay attention to the ontological foundations of their assumptions and models. Sad to say, economists have not paid much attention — and so modern economics has become increasingly irrelevant to the understanding of the real world. Within mainstream economicsinternal validity is still everything and external validity nothing. Why anyone should be interested in that kind of theories and models is beyond imagination. 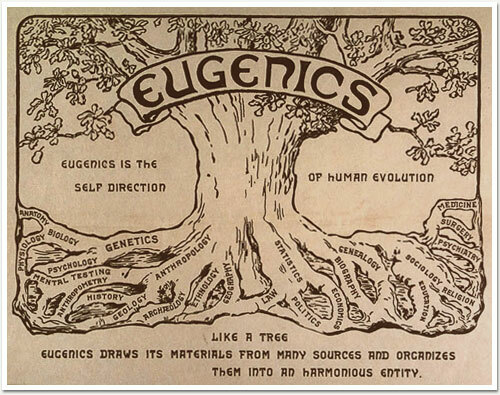 As long as mainstream economists do not come up with any export-licenses for their theories and models to the real world in which we live, they really should not be surprised if people say that this is not science, but autism! Since fully-fledged experiments on a societal scale as a rule are prohibitively expensive, ethically indefensible or unmanageable, economic theorists have to substitute experimenting with something else. To understand and explain relations between different entities in the real economy the predominant strategy is to build models and make things happen in these “analogue-economy models” rather than engineering things happening in real economies. Neoclassical economics has since long given up on the real world and contents itself with proving things about thought up worlds. Empirical evidence only plays a minor role in economic theory, where models largely function as a substitute for empirical evidence. Hopefully humbled by the manifest failure of its theoretical pretences, the one-sided, almost religious, insistence on axiomatic-deductivist modeling as the only scientific activity worthy of pursuing in economics will give way to methodological pluralism based on ontological considerations rather than formalistic tractability. To have valid evidence is not enough. What economics needs is sound evidence. Why? 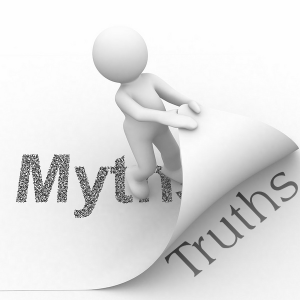 Simply because the premises of a valid argument do not have to be true, but a sound argument, on the other hand, is not only valid, but builds on premises that are true. Aiming only for validity, without soundness, is setting the economics aspirations level too low for developing a realist andrelevant science. 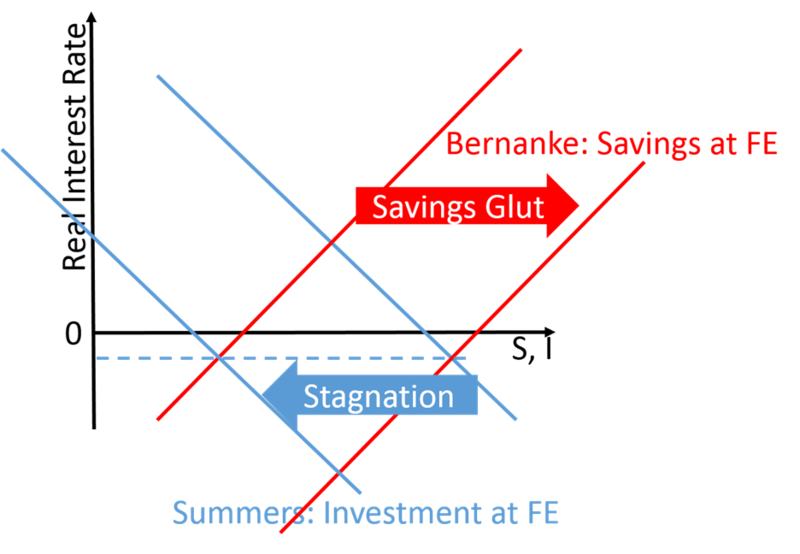 Bernanke-Summers Debate II: Savings glut, investment shortfall, or Monty Python? A Twitter follower accused me of being “a little nasty” with my last blog post. He was right, and I don’t apologize. I’ve spent 40 years trying to highlight just how limited the dominant ideas in economics are. But even I didn’t fully appreciate how tiny the intellectual gene pool behind these ideas was. Then, as I started to write a post on the economic issues in the Bernanke-Summers debate, I re-read Summers’ original secular stagnation post and realized that, not merely were the ideas coming from a single perspective, most of the major proponents of these ideas came not only from the same University (MIT), and even the same seminar (Class 14462, conducted by Stanley Fisher). Think of the dominant names in economics and there are a few obvious entries: Ben Bernanke; Larry Summers; Paul Krugman; Olivier Blanchard; Ken Rogoff. Summers acknowledged all of them (bar Krugman) as classmates from Stanley Fisher’s seminar, while Krugman did his PhD at MIT (as did the other dominant macro textbook author—and ex-advisor to George W. Bush and Mitt Romney—Gregory Mankiw). This goes well beyond the dominance of economics by a single school of thought, and I felt that “in-breeding” was a nasty but evocatively accurate way to express just how narrow the so-called “economic debate” had become—and therefore how justified were student calls for pluralism in economics. Hell, we don’t simply need pluralism: we need to hear opinions from people who didn’t attend Stanley Fisher’s lectures. Maybe being nasty about this might get people to realize why economics needs to change. Slower population and possibly technological growth means a reduction in the demand for new capital goods… Rising inequality operates to raise the share of income going to those with a lower propensity to spend… (Summers in “Reflections on the ‘New Secular Stagnation Hypothesis’”. 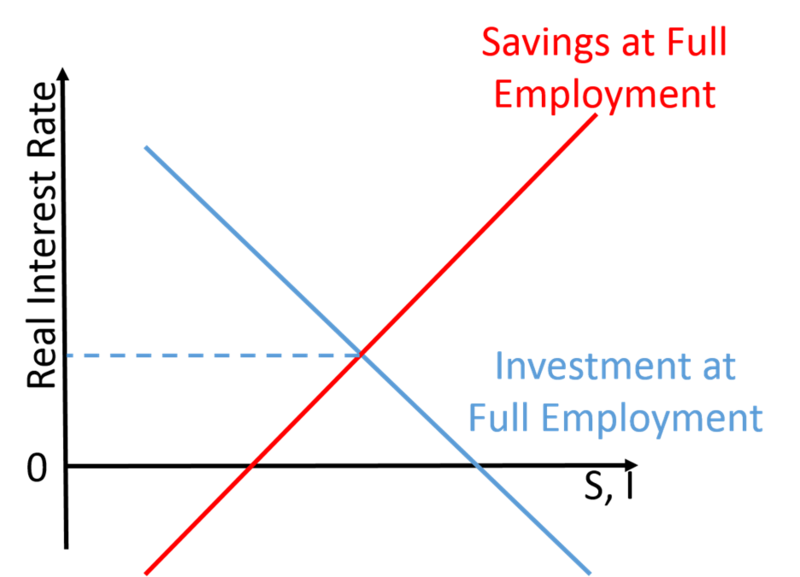 One sign that these two views are coming from the same mindset is that they can both be represented using the same diagram: the “Loanable Funds” model of the supply of savings as a function of the rate of interest, and of the demand for savings (investment) also as a function of the rate of interest, where the intersection of the two lines gives you savings and investment at full employment. In this model, the ideal world is the one shown Figure 2: the supply of savings and the demand for it to fund investment projects can be reconciled at a positive interest rate. Bernanke’s explanation for why we are in a prolonged slump involves shifting the Savings line out to the right—to represent the “global savings glut”. Summers’ explanation involves shifting the investment curve in to the left—to indicate a shortage of profitable investment opportunities. So what they are arguing is whether, in terms of this model, the blue demand (investment) or the red supply (savings) curve has shifted as shown in Figure 3, and if so what to do about it? Now there are empirical data that you can trot out to support each of these arguments, as Summers and Bernanke duly do. But what if the main factor causing slow growth rates—and low or negative interest rates—has nothing to do with this model? Then it won’t even get a look-in in their analysis, even if there happens to be strong data supporting it, because both Summers and Bernanke suffer from what Daniel Kahneman has called “theory-induced blindness”: the inability to see data that contradicts their underlying theory. The danger in economics is that Bernanke and Summers and the vast majority of influential economics share the same theory. This is crucial. If they all had theory-induced blindness, but some espoused different underlying theories to others, then at least we would get a range of blindspots to compare: some would not see what others did, and vice versa. To borrow from Monty Python, we could consider “something completely different”. Empirical research could then determine which theory was better (because its blindspots were less dangerous than its rivals). But in economics that doesn’t happen, because the Neoclassical-New Keynesian-MIT consensus is the only theory espoused. 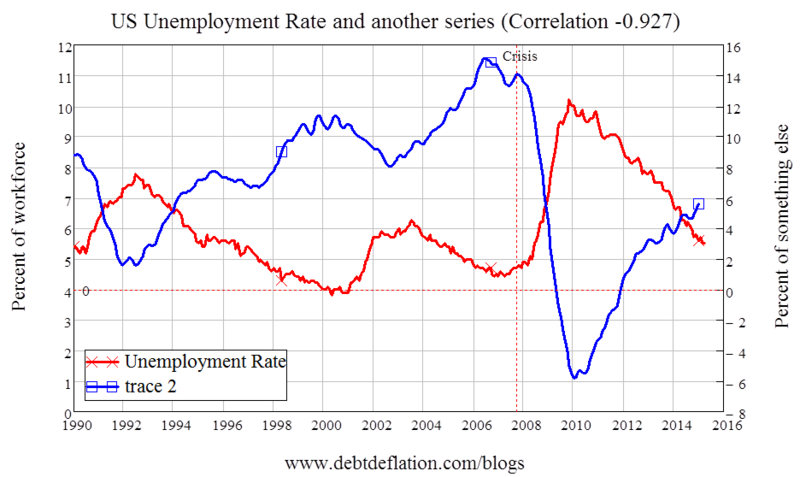 For instance, the final figure in this post shows a very strong relationship between the US unemployment rate and another unidentified economic variable. Neither Bernanke nor Summers would consider this as a candidate for explaining low interest rates and low growth rates after the crisis however, because the unidentified economic variable in Figure 4 doesn’t fit into their model. I’ll explain this “something completely different”, and why Bernanke and Summers and all the graduates of Stanley Fisher’s class 14462 can’t see it, in my next post. As no one interested in macroeconomics has failed to notice, Ben Bernanke is having a debate with Larry Summers on what’s behind the slow recovery of growth rates since the financial crisis of 2007. To Bernanke it’s basically a question of a savings glut. To Summers it’s basically a question of a secular decline in the level of investment. In my Treatise on Money I defined what purported to be a unique rate of interest, which I called the natural rate of interest, namely, the rate of interest which, in the terminology of my Treatise, preserved equality between the rate of saving (as there defined) and the rate of investment. I believed this to be a development and clarification of Wicksell’s ‘natural rate of interest’, which was, according to him, the rate which would preserve the stability of some, not quite clearly specified, price-level. I had, however, overlooked the fact that in any given society there is, on this definition, adifferent natural rate of interest for each hypothetical level of employment. And, similarly, for every rate of interest there is a level of employment for which that rate is the ‘natural’ rate, in the sense that the system will be in equilibrium with that rate of interest and that level of employment. Thus it was a mistake to speak of the natural rate of interest or to suggest that the above definition would yield a unique value for the rate of interest irrespective of the level of employment. I had not then understood that, in certain conditions, the system could be in equilibrium with less than full employment. I am now no longer of the opinion that the [Wicksellian] concept of a ‘natural’ rate of interest, which previously seemed to me a most promising idea, has anything very useful or significant to contribute to our analysis. It is merely the rate of interest which will preserve the status quo; and, in general, we have no predominant interest in the status quo as such. In the traditional loanable funds theory — as presented in mainstream macroeconomics textbooks — the amount of loans and credit available for financing investment is constrained by how much saving is available. 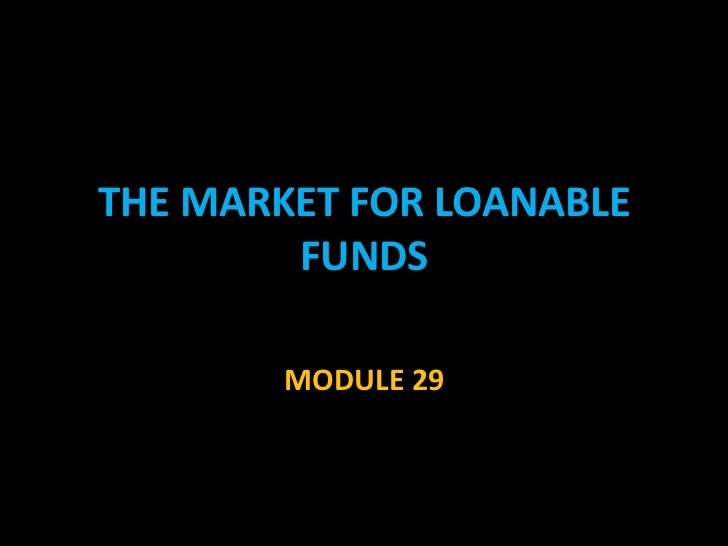 Saving isthe supply of loanable funds, investment is the demand for loanable funds and assumed to be negatively related to the interest rate. Lowering households’ consumption means increasing savings that via a lower interest. From a more Post-Keynesian-Minskyite point of view the problems with the standard presentation and formalization of the loanable funds theory are quite obvious. As already noticed by James Meade decades ago, the causal story told to explicate the accounting identities used gives the picture of “a dog called saving wagged its tail labelled investment.” In Keynes’s view — and later over and over again confirmed by empirical research — it’s not so much the interest rate at which firms can borrow that causally determines the amount of investment undertaken, but rather their internal funds, profit expectations and capacity utilization. As is typical of most mainstream macroeconomic formalizations and models, there is pretty little mention of real world phenomena, like e. g. real money, credit rationing and the existence of multiple interest rates, in the loanable funds theory. Loanable funds theory essentially reduces modern monetary economies to something akin to barter systems — something it definitely isnot. As emphasized especially by Minsky, to understand and explain how much investment/loaning/crediting is going on in an economy, it’s much more important to focus on the working of financial markets than staring at accounting identities like S = Y – C – G. The problems we meet on modern markets today have more to do with inadequate financial institutions than with the size of loanable-funds-savings. The loanable funds theory means that the interest rate is endogenized by assuming that Central Banks can (try to) adjust it in response to an eventual output gap. This, of course, is essentially nothing but an assumption of Walras’ law being valid and applicable, and that a fortiori the attainment of equilibrium is secured by the Central Banks’ interest rate adjustments. From a realist Keynes-Minsky point of view this can’t be considered anything else than a belief resting on nothing but sheer hope. [Not to mention that more and more Central Banks actually choose not to follow Taylor-like policy rules.] The age-old belief that Central Banks control the money supply has more an more come to be questioned and replaced by an “endogenous” money view, and I think the same will happen to the view that Central Banks determine “the” rate of interest. The classical theory of the rate of interest [the loanable funds theory] seems to suppose that, if the demand curve for capital shifts or if the curve relating the rate of interest to the amounts saved out of a given income shifts or if both these curves shift, the new rate of interest will be given by the point of intersection of the new positions of the two curves. But this is a nonsense theory. For the assumption that income is constant is inconsistent with the assumption that these two curves can shift independently of one another. If either of them shift, then, in general, income will change; with the result that the whole schematism based on the assumption of a given income breaks down … In truth, the classical theory has not been alive to the relevance of changes in the level of income or to the possibility of the level of income being actually a function of the rate of the investment. There are always (at least) two parts in an economic transaction. Savers and investors have different liquidity preferences and face different choices — and their interactions usually only take place intermediated by financial institutions. This, importantly, also means that there is no “direct and immediate” automatic interest mechanism at work in modern monetary economies. What this ultimately boils done to is — iter — that what happens at the microeconomic level — both in and out of equilibrium — is not always compatible with the macroeconomic outcome. The fallacy of composition (the “atomistic fallacy” of Keynes) has many faces — loanable funds is one of them. Increased investment will always be accompanied by increased saving, but it can never be preceded by it. Dishoarding and credit expansion provides not an alternative to increased saving, but a necessary preparation for it. It is the parent, not the twin, of increased saving. So, in way of conclusion, what I think both Bernanke and Summers “forget” when they hold to the loanable funds theory and the Wicksellian concept of a “natural” rate of interest, is the Keynes-Minsky wisdom of truly acknowledging that finance — in all its different shapes — has its own dimension, and if taken seriously, its effect on an analysis must modify the whole theoretical system and not just be added as an unsystematic appendage. Finance is fundamental to our understanding of modern economies, and acting like the baker’s apprentice who, having forgotten to add yeast to the dough, throws it into the oven afterwards, simply isn’t enough. The general equilibrium approach starts with individual decisions. It assumes that trades are voluntary and that there exist mutually advantageous opportunities of exchange. Up to here, everyone can agree. The problem lies in the next step. At this point, let us folllow David Kreps’s (1990) reasoning in his A Course in Microeconomic Theory. Kreps asks the reader to “imagine consumers wandering around a large market square” with different kinds of food in their bags. When two of them meet, “they examine what each has to offer, to see if they can arrange a mutually agreeable trade. To be precise, we might imagine that at every chance meeting of this sort, the two flip a coin and depending on the outcome, one is allowed to propose an exchange, which the other may either accept or reject. The rule is that you can’t eat until you leave the market square, so consumers wait until they are sat- isfied with what they possess” (196). Kreps “imagines” other models of this kind. In each of them by the word “market” he means a “market square,” and he introduces rules (“flip a coin,” “nobody can leave before the end of the process”). He is aware that “exploration of more realistic models of markets is in relative infancy.” And when he speaks of “more realistic” models, he means more realistic with respect to perfect competition. But the problem with perfect competition is not its “lack” of realism; it is its “irrelevancy” as it surreptitiously assumes an entity that gives prices (present and future) to price taking agents, that collects information about supplies and demands, adds these up, moves prices up and down until it finds their equilibrium value. Textbooks do not tell this story; they assume that a deus ex machina called the “market” does the job. Sorry, but we do not want to teach these absurdities. In the real world, people trade with each other, not with “the market.” And some of them, at least, are price makers. To make things worse, textbooks generally allude to some mysterious “invisible hand” that allocates goods optimally. They wrongly attribute this idea to Adam Smith and make use of his authority so that students accept this magical way of thinking as a kind of proof. Perfect competition in the general equilibrium mode is perhaps an interesting model for describing a central planner who is trying to find an efficient allocation of resources using prices as signals that guide price taker households and firms. But students should be told that the course they follow—on “general competitive analysis”—is irrelevant for understanding market economies. Still — almost a century and a half after Léon Walras founded neoclassical general equilibrium theory — “modern neoclassical economics” hasn’t been able to show that markets move economies to equilibria. We do know that — under very restrictive assumptions — equilibria do exist, are unique and are Pareto-efficient. One however has to ask oneself — what good does that do? As long as we cannot show, except under exceedingly special assumptions, that there are convincing reasons to suppose there are forces which lead economies to equilibria — the value of general equilibrium theory is negligible. As long as we cannot really demonstrate that there are forces operating — under reasonable, relevant and at least mildly realistic conditions — at moving markets to equilibria, there cannot really be any sustainable reason for anyone to pay any interest or attention to this theory. A stability that can only be proved by assuming “Santa Claus” conditions is of no avail. Most people do not believe in Santa Claus anymore. And for good reasons. 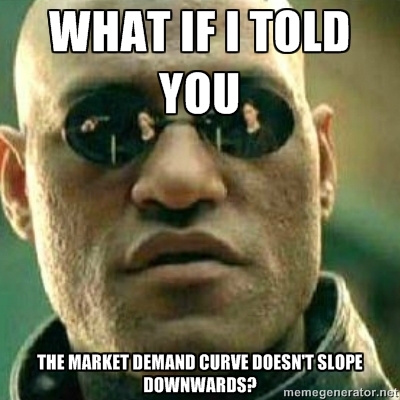 Santa Claus is for kids, and general equilibrium economists ought to grow up. Continuing to model a world full of agents behaving as economists — “often wrong, but never uncertain” — and still not being able to show that the system under reasonable assumptions converges to equilibrium (or simply assume the problem away) is a gross misallocation of intellectual resources and time. This entry was posted in IMPERIAL HUBRIS AND HYPOCRISY, INDIGENOUS SCIENCE AND SCIENTIFIC METHOD, ECONOMIC DEVELOPMENT AND SUSTAINABILITY, MSM MANIPULATION, POLITICAL ECONOMY OF IMPERIALISM, Neoclassical and Neo-liberal Economics, rise and fall of empires, IMPERIAL SOCIAL SYSTEMS ENGINEERING, EPISTEMOLOGY AND SCIENTIFIC METHOD, HOW TO LIE WITH STATISTICS, corrupt elites, ideological classrooms, Real World Economics, Full SPECTRA Dominance, Wealth and Income Inequality, Imperial Impotence, Academic Left, Comparative Systems and Constitutions, Cultures of Narcissism, Proto-Fascism. Bookmark the permalink.